The five-star Sofitel Legend People’s Grand Hotel Xian is a magnificent French- and Sino-Russian-style building, centrally located inside the city of Xian’s Ming Dynasty walls, near the iconic Drum and Bell towers. This historic setting gives the hotel a special atmosphere and guests will be delighted with outstanding Chinese hospitality throughout their stay. Originally opened as a State Guesthouse in 1953, this hotel will give guests a great sense of the history of the last 13 dynasties. The hotel, only recently re-opened, has undergone a magnificent transformation to become the crown jewel of Xian. The Sofitel Legend People’s Grand Hotel Xian is the only Sofitel Legend in China and one of six in the world. 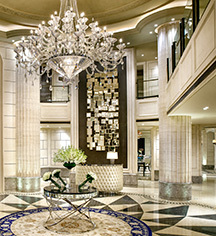 The Sofitel Legend People’s Grand Hotel Xian features 44 elegant guestrooms and 27 palatial suites. Each guest will enjoy staying in the hotel’s beautifully decorated guestrooms and will be surrounded by luxurious amenities, from marble baths with clawfoot tubs and French floral arrangements, to personalized, 24-hour majordomo service. Guests will find that there is plenty to do, whether exploring the hotel’s beautifully maintained gardens, visiting one of the inspiring culinary experiences on-site, or spending the day relaxing at the spa. The hotel sits in the perfect location for an adventure into the city. Guests can walk to the famed Ming Dynasty Xian City Walls, Muslim Street, and the Great Mosque of Xian. The Terracotta Army tourist site is located just 45 minutes from the hotel and transportation can be arranged by the hotel’s concierge. The Sofitel Legend People’s Grand Hotel Xian offers guests access to China’s ancient history, while maintaining a warm, hospitable, and comfortable luxury atmosphere. 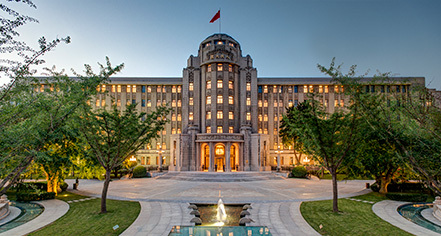 Sofitel Legend People's Grand Hotel Xian, a member of Historic Hotels Worldwide since 2018, dates back to 1953. The hotel’s unique private museum features memorabilia from the early years. The most precious items include a gold serving platter and matching cloche, used only for VVIPs in times past when this was Xian’s only hotel licensed to accommodate foreign dignitaries. Cancellation Policy: No charge before 6:00 p.m. (local time). Early Check-In/Late Check-Out: Half-day room charge before 6:00 p.m. and a full night charge after 6:00 p.m.
Hotel/Resort Fees & Taxes: 10% service charge and 6% VAT. Occupancy Restrictions: Two adults and one child. Rollaways: Complimentary for children under 12, otherwise there is a fee of ¥575 per stay. Shuttle Service: Limo and town car services are available. Smoking Policy: Smoking is only allowed in designated smoking areas. The five-star Sofitel Legend People’s Grand Hotel Xian is a magnificent French- and Sino-Russian-style building, centrally located inside the city of Xian’s Ming Dynasty walls, near the iconic Drum and Bell towers. Learn more about the History of Sofitel Legend People's Grand Hotel Xian .